Rock Cakes were quite popular in Malta. I remember my sister making them at school during her Home Economics Class. They had come so hard that I used to think that they were called Rock Cakes for that reason and not because they might look like rocks. Growing up, I remember this vendor in his cream van who would come to sell his pastries in the village where we spent our summers and these were one of my favorites! So I tried to make a gluten free version. 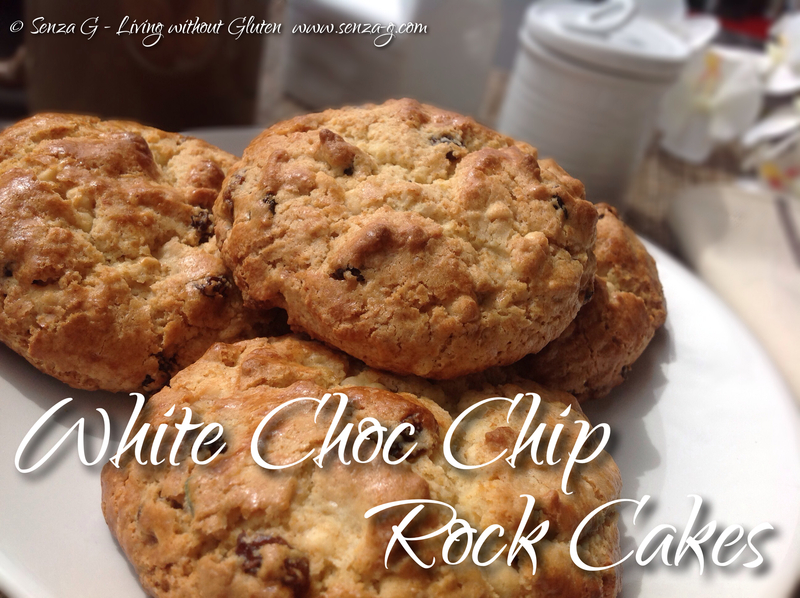 I also added some chocolate chips to the traditional Rock Cake recipe which gives it even more flavor. Combine the gluten free flour, ground almonds and gluten free baking powder in a large bowl. Rub in the butter into the flour mix until it resembles fine breadcrumbs. Mix in the sugar, mixed dried fruit, white choc chips, mixed spice, cinnamon and lemon zest. Beat the egg into the milk. Add the vanilla essence. Pour into the flour and mix until dough just comes together. The dough will be quite sticky. Using a spoon or an ice cream scoop, place mounds of the mix and place onto the baking tray. Space them out as they spread. Brush with beaten egg wash. You can also sprinkle the top with sugar if you like. Bake for approximately 20 minutes or until they start turning golden brown.